Take lots of time for shared meals, sit at the table with your child without the TV being switched on or other distractions. Your child has his/her own place in the safe high chair where they can concentrate on eating. Provide meals already at this phase which take place at rather regular times. Create a relaxed atmosphere where everyone has time to finish the meal and may also leave something on the plate if they are not very hungry. Don’t prolong meals, though. After 30 minutes, the meal should be over. Then it’s time to play again! Children’ s appetites are different from day to day, so don’t force them to eat up. Avoid snacks between meals if possible as they reduce the appetite for a proper meal. Set the rules at the table from the beginning. Let your child watch you cook and, as they get older, let them help. 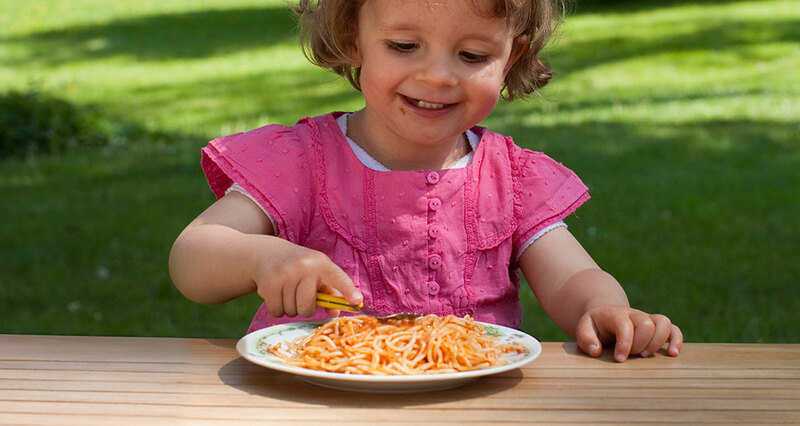 This way, children can develop a sense of enjoying food and learn that eating is fun. Encourage your child’s development. Don’t give them a bottle to drink from anymore; your child should learn to be drinking all drinks from a cup now.